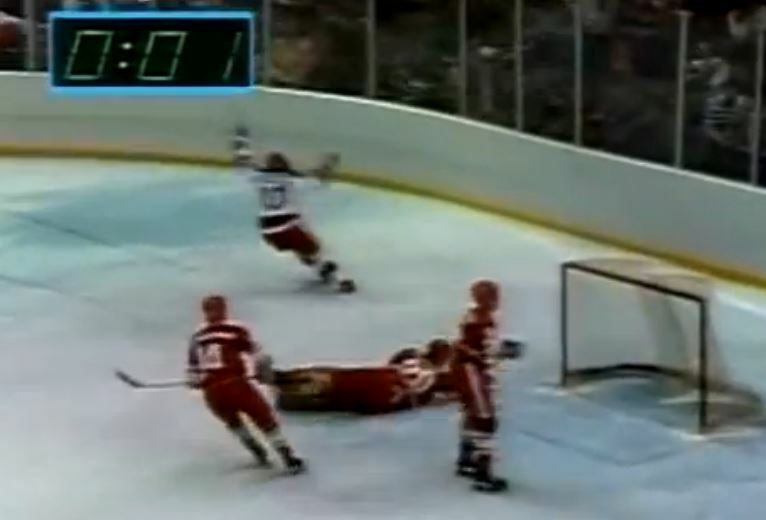 35 years ago today, February 22, 1980 … DO YOU BELIEVE IN MIRACLES … YES!!! It is hard to believe that it has been 35 years since “Miracle on Ice,” it seems like just yesterday in some respects and in others it seems so long ago. In a time that many today under the age of 45 could never comprehend. There was no social media, no Twitter, no Facebook and no Internet to follow the game live. To show just how far back we reminisce, ESPN had just started operations in September 1979. As a matter of fact, that was probably a good thing as they game was scheduled to be played in the afternoon, but not to be shown on TV until later that night in prime time. As it turned out, the Russians refused to change the time of the game so it could be televised in America live. Imagine that from the USSR. Do you remember where you were, when you watched the one any only DREAM TEAM? Watching highlights of this game always puts a smile on my face and a tear to my eye. Remember back to 1980, the game was more than just a hockey game, it was us against them, it was freedom vs. communism. It was a piece of the Cold War played out in an arena, of a sheet of ice in Lake Placid, NY during the 1980 Winter Olympics. It was the fresh faced college kids from America taking on the the paid athletes of so-called amateurs of the big bad Soviet bear. As Al Michaels would later say, the confluence of events was so extraordinary, it could never happen again. Who knew that a bunch of college kids over a two week period would become the essence and the vehicle to make Americans proud again? That is exactly what ‘Miracle on Ice’ was and did and the game will forever be remembered as the greatest sports moment in US history, EVER! Final minutes of Miracle on Ice: Do you believe in Miracles … YES!!! For events that take place, we sadly remember where we were when terrible ones occur. Everyone remembers where they were when JFK was assassinated, when the Challenger Space shuttle blew up in 1986 (VIDEO) and when on 9-11 terrorists flew planes into the World Trade Center, the Pentagon and a field in Shanksville, PA. However, for those that were alive and were old enough to watch the medal round game between the USA and USSR, you remember like it was yesterday where you were and the feeling of incredible patriotism and pride that you had as a bunch of college kids coached by the dearly departed Herb Brooks pulled off the greatest upset in sports history. Over the weekend, all of the living members of the 1980 US Hockey team came together in Lake Placid, NY to reunite and fondly remember that heroic day and the weekend that the Americans brought home the gold medal, first defeating the Russians 4-3 and then beat Finland 4-2. The ovation wasn’t quite as deafening as it was 35 years ago. It was riveting, nonetheless, for Dave Christian and his old Olympic buddies, together again to celebrate their Miracle on Ice. However, let’s go back and fondly remember the greatest sporting event in American history and the greatest upset victory ever. It was Friday, February 22, 1980 and the United States hockey team was slated to play the invincible, mighty Soviet Union in the 1980 Winter Olympics in Lake Placid, New York. The Soviet Union hockey team was a machine, who had not lost the Olympic gold medal since the 1960 Squaw Valley Olympic Games. The Soviet team was basically a professional hockey team, playing the United States, made up of a collection of armature college hockey players. Many of those kids would go onto to greatness in the NHL, but that was down the road. On a personal level, I can remember like it was yesterday. I had been discharged from the hospital earlier in the day after spending almost all of the Olympics in the hospital after suffering from an acute appendicitis, emergency surgery and complications following the surgery. I finally made it home around 5 pm to prepare and watch the game later that night. The irony being that the hockey game actually began live at that time, America on the East coast would not see the tape delay of the game until 8 PM. I can remember waiting in my bedroom in anticipation, trying to get caught up on school work as I had missed two weeks of school having been in the hospital. My father came up to my room and asked my if I wanted to know the score, he had heard it on the news, I said … NOOOOO!!! I had watched all of the games that were televised from my hospital room and there was no way I wanted to know the outcome in advance after all this. The 1980′s were a different time, the Soviet Union had invaded Afghanistan, US hostages were being held in Iran, the United States was in the midst of a terrible recession, marked by what many remember as the misery index (double digit inflation, unemployment and inflation rate), high gas prices and a disastrous Jimmy Carter presidency. The mood in America was grim, patriotism was down and nothing seemed to be going good. Wait a minute, did I just describe the Barack Obama presidency? But I digress, back to the story at hand. As previously stated, the 80′s were a different time, from my home TV in New England we got 3 channels, ABC, CBS and NBC. Well actually 5 if you consider those 2 UHF channels that you had to maneuver that pesky antenna to have them viable. Oh yes, and then there were the rabbit ear antenna on the TV that had to be at just such in order to view anything. What, you don’t remember rabbit ears? 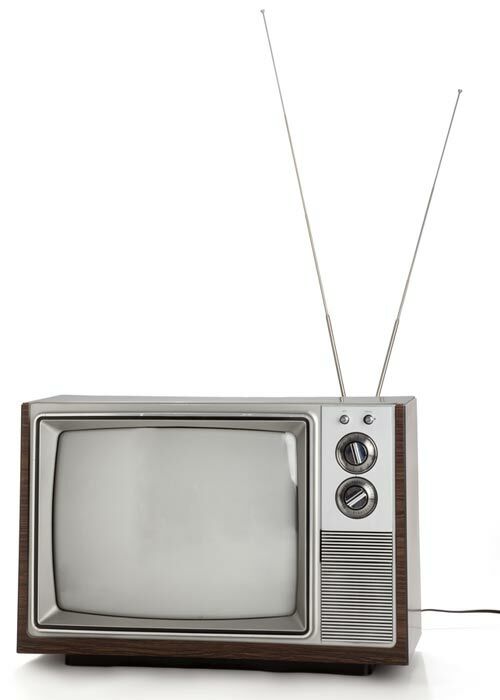 It is kind of comical when one tries to describe this stuff to a 20-30 year old, what you mean there was no digital TV, no HD TV, no cable … 3 channels, are you kidding!!! Prior to the game between the USA and USSR, United States head coach Herb Brooks gave Team USA one of the greatest motivational speeches in sports history. The speech was made famous by the 2004 movie ‘Miracle’, however, word for word, Brooks gave the speech to the wide eyed college kids. 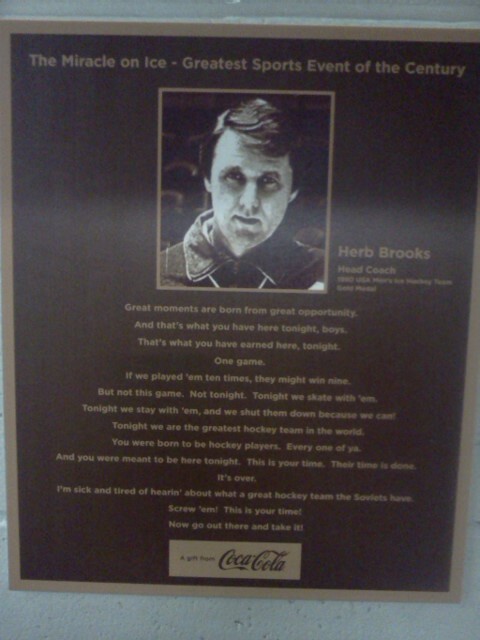 A plaque exists today in Lake Placid at the aptly named the 1980 Rink -Herb Brooks Arena. “Great moments … are born from great opportunity. And that’s what you have here, tonight, boys. That’s what you’ve earned here tonight. One game. If we played ‘em ten times, they might win nine. But not this game. Not tonight. Tonight, we skate with them. Tonight, we stay with them. And we shut them down because we can! Tonight, WE are the greatest hockey team in the world. You were born to be hockey players. Every one of you. And you were meant to be here tonight. This is your time. Their time is done. It’s over. I’m sick and tired of hearing about what a great hockey team the Soviets have. Screw ‘em. This is your time. 20 Things You Might Not Know About the “Miracle on Ice”. I think the only one I was not aware of what the Jammie Farr, who played Klinger on M*A*S*H, was the only celebrity in attendance. Hmm, can we really refer to Jammie Farr as a celebrity? For your viewing pleasure, below is the full VIDEO version of the 1980 Olympic medal round game between the United States hockey team vs. the original evil empire, the Soviet Unions, the USSR. Every February 22 I make sure that I find time during the day to watch the full game and remember back in time those incredible moments of the feeling of pride and admiration of that game. As we now know and knew at the time, it was more than just a hockey game. It was a proxy war fought on a sheet of ice where the United States of America defeated the invincible Soviet Union and gave a county a rallying point that thrust us into the 1980′s, Ronald Regan and the fall of the Soviet Union. When the USA fell behind early in the game 1-0, I remember going, “rut-oh” please do not tell me we are about to get steam-rolled by the Soviets. After all this, after all the USA hockey team had accomplished, they did not deserve to get embarrassed. The Soviets Union had stormed through their opposition during group play by destroying the opposition as they defeated Japan 16–0, the Netherlands 17–4, Poland 8–1, Finland 4–2, and Canada 6–4 and advanced to the medal round. Would the USA be next? However, after giving up the early goal the USA seemed to settle down a bit, although you could tell they were tight, the crowd was tight, something good had to happen to releave the nerves. Then at the 14:03 Buzz Schneider scored, with an assist from Mark Pavelich, coming down the left wing at quite an angle, putting one past goalie Vladislav Tretiak, tying the score at 1-1. The goal was huge. Why, because it was the first one, it tied the score and it was a precursor of things to come as it was an unusual goal to the best goal tender in the world to give up. Not going down by multiple goals was a big motivational advantage for the USA as it played into Brooks’ speech … “Tonight, we skate with them. Tonight, we stay with them. And we shut them down because we can!” However, the USSR scored again with 2:20 remaining in period #1 as they skated in so easily thru the USA defense and one of the Russian “ov’s” scored. I can remember thinking, “eesh, that was way to easy”. The CCCP was ahead 2-1. The Soviet’s kept putting so much pressure on in the USA end as goalie Jim Craig had to make amazing save after amazing save. I thought to myself, “Craig was playing the game of his life, could this kid keep it up.” Ha, I call him a kid now, I was younger than all of those playing for USA at the time. 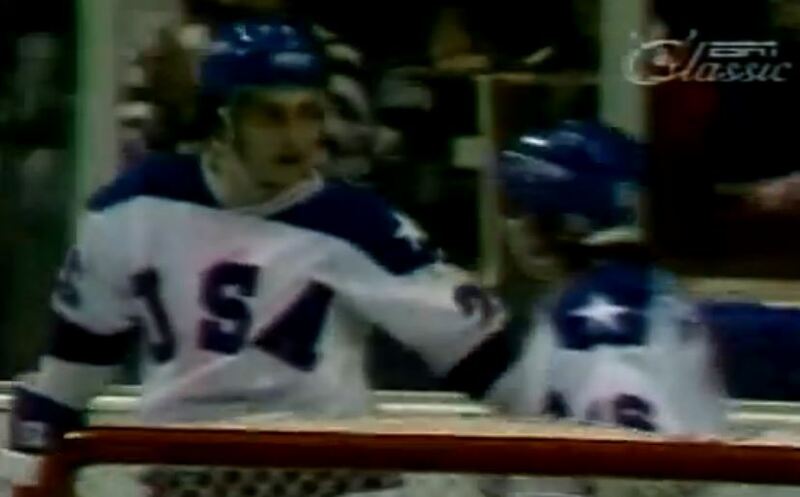 At the 30:40 minute mark of the video above, Johnson scores past Tretiak with 1 second left. Then it happened, out of no where. With 5 seconds left in the period, Dave Christian fired a slap shot from 100 feet away from beyond the center line on goal, Tretiak made the save but misplayed the rebound, and Mark Johnson split the defense got the rebound and scored with 1 second on the clock to tie the game at 2-2. The crowd erupted at the arena and I can remember jumping off my bed in excitement and damn near pulling my stitches. For one brief moment, the Soviet hockey machine let their guard down thinking the period was all but over and it cost them dearly. What was interesting in retrospect as I never remembered it at the time was that because there was 1 second left in the period, the referee needed by rule to drop the puck at center ice. It was goalie Vladimir Myshkin that came back from the dressing room to be in goal, not Tretiak, as following the American goal the entire Soviet team had left the ice and went to the locker room. This would be an interesting omen. Interesting indeed. The start of the second period began with the unthinkable, the USSR National team coach, Viktor Tikhonov, pulled the best goalie in the world, Vladislav Tretiak, and replaced him with Vladimir Myshkin. What? I remember thinking back at the time, wow, they pulled their best goalie because of one shaky period, unreal. Even in the eyes of a 14 year old who had played team sports his entire life, knew this was big and a knee-jerk, emotional reaction. Russians acting emotionally? That was akin to Mr. Spock from ‘Star Trek’ fame acting like a human. Russian coach Tikhonov would later say that this move was the “turning point of the game” and called it “the biggest mistake of his career”. That being said, the second period was tough to watch as the USA was dominated by the Soviet Union being out shot 12-2. In the process the Russians scored another goal in the onslaught of Jim Craig as the USSR went ahead 3-2. Thanks to Craig, the Russians only scored 1 goal, which turned out to be huge. 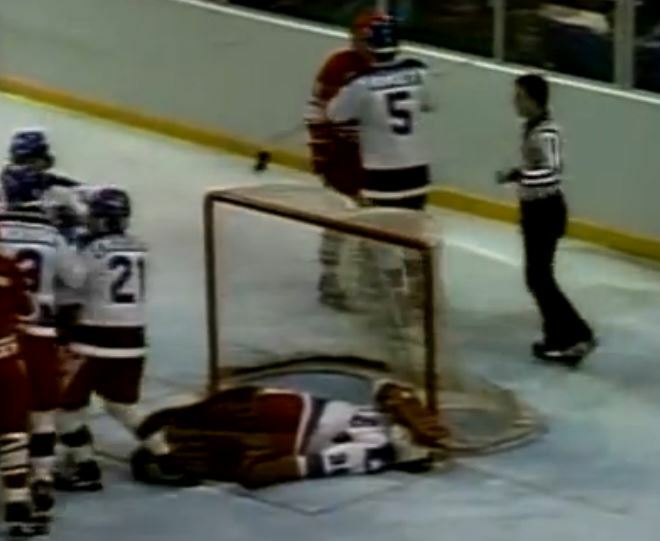 It looked bleak for the Americans as the Russians crashed into goalie Jim Craig and appeared to have knocked him out as he lay horizontal on the ice. The period ended with the Soviet Union leading the USA 3-2. After being outplayed most of the beginning of the third period and able to muster very little offense, USA got a power play. I thought to myself, finally, a chance to maybe go on offense. As the power play was running out and the Americans had done little to nothing in taking advantage of the man advantage … it happened. In the final rush of the power play opportunity with 13 seconds left in the penalty, Mark Johnson fired off a shot that went under Myshkin into the net at 8:39, tying the game at 3-3. The crowd went crazy. I remember again jumping out of my chair, popcorn flying everywhere, and when going OMG, did I just pull my stitches again. I did not care. The goal came out of no where and energized the American crowd. THEN IT HAPPENED … THE SECOND SHOT HEARD ROUND THE WORLD. Almost like it was scripted out of a Hollywood movie, Ken Dryden, one of the announcers and former Montreal Canadian goaltender said,”the US team is depending just a little too much now on Jim Craig” and then it happened, oh boy it happened. USA captain Mike Eruzione, who had just come onto the ice, fired a shot past Myshkin, and Team USA had the lead on the Soviet Union for the first of the game, 4-3. ALL PANDEMONIUM BROKE OUT!!! At that moment 35 years ago I can remember thinking to myself, Oh my God they are going to do it. We are going to beat the Soviet Union, those bastards! Why would ABC sports being showing this game in tape delay if the USA was not going to pull this off? You see folks, back then the MSM actually showed some sort of patriotism for a beleaguered country. They were not a bunch of socialists like today that seem to revel in bad things, all the time. The crowd went mental, USA teammates mauled each other on the boards after the goal and the Soviets were in disbelief. I can remember the look on coach Herb Brooks face, the smile, the look of … my boys are going to do this, this truly is “your time” and they did “go out there and take it!” Brooks reactive was priceless, a smile. A smile? Brooks never smiles! As Al Michaels’ said, “now we have bedlam”. The score was USA 4 – USSR 3, but there were were exactly 10:00 minutes to go, half a period. Then came the next 10 minutes that seemed like 30. The clock could not countdown fast enough as the Soviet hockey team made offensive rush after offensive rush. I remember Herb Brooks telling Team USA, “play your game boys, play your game.” Then there was 5 minutes left. Then there was 3 minutes left and no one was breathing. I can remember thinking with about 1:20 minutes left in the game, I think we have this. Because the Soviet Union always blew their opponents out, they had no idea how to play a close game and it was showing. It was hard to believe after having seen the Soviet Red Army team and Wing team defeat NHL teams and NHL All-Star teams, the Soviets were in disarray and panicking. I thought to myself as the USSR cleared the puck from their zone, why aren’t they pulling their goalie? Why are they not putting another attacker on the ice, it was obvious at this point all the USA was trying to do was clear their defensive zone, not score. But the Soviet coach never pulled the trigger. And when there was 33 seconds left, I had a smile ear to ear. It was over, the puck was cleared from the USA end and the Soviet Union was in complete and total disarray. They were now playing a game they did not now. The Soviet bear had cracked under the pressure. I can remember just welling up with emotion and crying with pure joy. The chants of USA, USA, USA rang out throughout the arena and across the United States. The United States Hockey team had shocked the Soviet Union and the world. The invincible commies had been taken down by America’s youth. The pure emotion of the USA college kids was priceless and so pure and honest. This is what winning the gold medal looked like when no one gave them a chance. 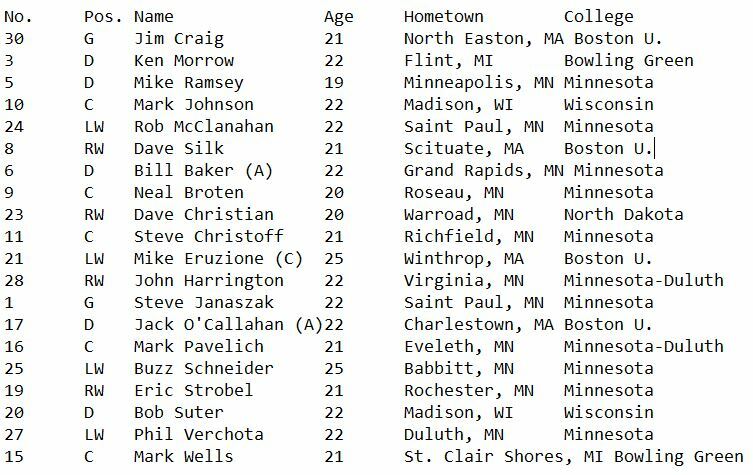 The average age of the USA hockey team was 22. They had done the unthinkable and much, much more. They had beaten the Russians. But what these kids really did not realize, is that they energized a nation. The USA had not won the gold medal, at least not yet. However, they had done something that no one had even dreamed of, they beat the Soviet Union 4-3 and went down not only in sports history, but in the annuls of American history as the symbol of hope, dreams and all things are possible. This should be a lesson to children and adults alike … banging on the glass at a Hockey game has it’s consequences. A Hockey fan was at a Columbus Blue Jackets and Montreal Canadiens NHL game on Thursday pounding on the plexiglass when … well just watch for yourself and enjoy the many extra angles and close-up replays. Of course in this day and age of over-litigious actions, look for the parents to sue for assault. We do hope the kid was okay and remember, stay away from the glass.